The old blue box and old purple box is updated with many of the new world and dimensional gorge items, including those dropped by the MVP monsters. Exclusively available in Old Blue Box (OBB) and Old Purple Boxes (OPB) is the Balloon Hat. 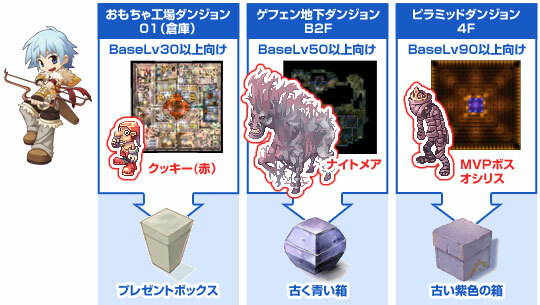 Illustration: Balloon Hat (OPB & OBB), Bloody Branch (OPB), Treasure Box (OPB & OBB), Diabolus Maneaut (OPB), Valkyrja’s Shield (OPB & OBB), Coin Holder (OBB). Note: Balloon Hat on iRO is called the Tam. On jRO, the headgear reduces aftercast delay by 1% per refine. Got a wedding coming up? Present box now contains items related to weddings. It also contains many new taming items, pet accessories, special items like Valhalla’s Flower, and many types of special stones and ore. 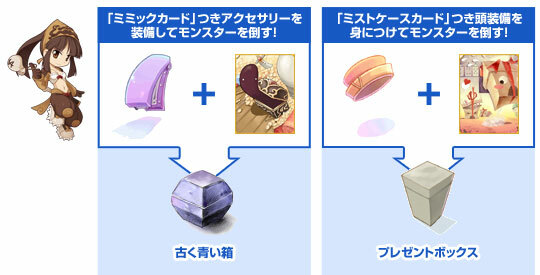 Jewelry Boxes are now updated with new kinds of accessories, including those from the new world and dimensional gorge. 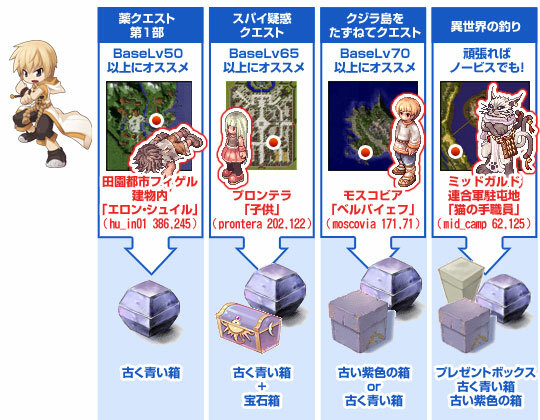 The website also is kind enough to provide example places and monsters to obtain these boxes. I won’t be translating these, but its here just to show the information that is provided. I do trust all of the ideas you have presented on your post. They’re really convincing and can definitely work. Nonetheless, the posts are too brief for beginners. May just you please extend them a bit from subsequent time? Thanks for the post. I’m commenting to let you know what a useful discovery our child developed visiting your web page. She came to find too many things, which included what it’s like to have a great coaching mindset to have many people without hassle know specific tricky issues. You undoubtedly did more than readers’ desires. Many thanks for rendering these invaluable, trustworthy, informative and also easy tips about that topic to Janet. certainly like your website but you need to take a look at the spelling on quite a few of your posts. Several of them are rife with spelling problems and I to find it very bothersome to tell the truth however I will certainly come back again.